h.,l(i i, Miami Woman s Club. ,1 by Dr. A. L.
' revealed at 11 A.M.
be mailed to the workers. Mam .re Croiner; Temple Israel. own more than a million acres. on account of the war. to their death" shall be punished. rectorship of the WRB. .
barns and woods along the way. met by those from Budapest. ami and now of Tampa, Florida. of the two religious institutions. hidrik plra*lnK the Italian ca- ground forces in Poland. Bureau will be held on Monday. ing, 127 N.W. Second Street. Dr.
Albert E. Rosenthal will preside. to invite them to our homes for the Sedarim nights. the community to invite service men for the Sedarim nights. for your son. 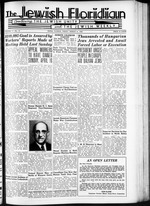 Call the Jewish Welfare Board or the Y.M.H.A..
held at the Biscayne Temple. rangements, assisted by Mrs. M.
Mrs. Lubv. 2-8000 and Mrs. Ross. is the subectot poster contest. S.W. eth St. at 15th Ave.
OPEN AT 1:45 P. M.
N it Sleep.'' by Leland Stowe. the largest project at this time. tional nominations may be made. and a discussion of the topic. Zukernick. president, and ack P.
of Mrs Henry Seitlin. Mrs. S.
Wittel, Mrs. S. Gergert, Mrs. H.
Friedman, Mrs. S. Lavine. Mrs.
A Kaplan. Mrs. K. Lurie, Mrs. E.
rangements are in chL*ra Ar"
proceeds were given to the i'onal Council of Jewish Women. .te Greenberg. J? 3 th? Beachcomber Club. ---------,---------_ also present Mrs. Edith Land. Miss Anyuta Mehcov. Mrs. I. G.
Kol ley, chairman of the affair. Graduate of the Jewish Hot. pital of Philadelphia at Mohel. pital for patt five years. York City. Its contents LT.
eral sections covering a variS." tation" Dr H. M. WertheimoS. OPEN FROM 12 NOON TO 10 P. M.
1 P- M. 8 A. M.
laee h. w. rtn at. rK*jZ.
. |.|. ....,*... -,-,-,-,,-, nji_n_i-i n_n_rm.
' daughter. Mr and Mrs. J. A Gift of Good Tatte"
York City, and well known actor. Miami Beach and New York. Lt.
Rosen is a son of Mr. and Mrs.
ding is planned for May. irom the University of Miami. dered to duty in Norfolk, Va.
Services were held at 4 p. m.
died Friday at his home, 1885 S.
New York, Mrs. Dorothy Halprin. Dr. and Mrs. Jacob H. Kaplan. tended vacation in the North. Dr.
will visit her mother and friends. became the bride of Lewis W.
a sister of the bridegroom. and best man for his son. ple will reside at 714 15th St.
ning at 820 N. W. 7th Avenue. !Mr. and Mrs. H. Ross, 1101 S. W.
responded to the boy's address. Cpl. and Mrs. Lee Minor. 1833 S.
"BEST WISHES FOR A KOSHEREN PESACH"
Plant and Main Offices, 21 S. W. Second Av i ami. Fla.
" Who Killed Bjorn Faulkner??? than vindicated with the appointment of John W. Fehle. the wrdid GU1L1 Y o, NO! That Mr. Pehle was the right man for the job was quite evi- A ;. year and that the Pacific war will take another two years to win. : of the gayest of fetes. are now seemingly closed to Jewish refugees in Europe. has shown that he has the will. tific contribution to the war effort. "I know it from my own definite personal experience that Dr.
take in terms of the war effort," said Vice-President Wallace. itself. And so he brought alcohol to do the job." his sons was wounded in action. through, you may expect an extraordinarily fine performance. indignation. "Why don't you solute me?" he roared. ..
Ed the Jewish Labor Committee. Iced with a serious problem. more will be printed here anon. served at the conference table. against the deadliest of foes. rest these long, long nights. Friday, April 7, starting at 8 P.M.
76th St. and Amsterdam Ave.
munity servant speaks for itself. KEEP EM FRYINGSEE SPRINGER FOR SPRINGERS"
ing I leach Y, 8 p. m.
day anil Tuesday, 8 p. m.
meetlUK. Temple Israel, 12:30 p. m .
gC .k rluh> 12nn """"; Hadassah. in the Post War World," 1:10 p. m.
Mrs. M. F. Wittichen. Mrs.
Strongman Miller, Mrs. H. O.
the efforts of Lex Green. customers with specially supervised products for their Passover holidays. cost has always exceeded any possible profit. disappointment that we do so. be in a position to serve you. With best wishes for a Happy Passover. long fray, The Widener winner. hdd by Councilman Ralph I ole. clared, "and is entitled to strong. Sudorim will be conducted on both nights by Rev. T.
cka bus out N. W. 7th Ave.
n, !! rman ll It bi rg, Geo. Washington Are. at 13th St. I mi for every $3.00. weeks ago. cabled his mother. thv* correspondent of Yank. HOSen family Have Briet for 22-year-old T/Sgt. Harold B.
r southerner, who had seen ______ to step up and take a bow. fcrsev papers. Following is a in his navy uniform. missions. |od of a patient horse; and to make on mother's activity in 'Phyllis Marie." rhanlam C A Zwitman of approved, however, Richard's poration of Savannah, T/Sgt. (uppers to remote and obscure the War Finance Committee. the law fairly and impartially. pathetic ear to those in dispute. hys dwindle to little more than c/o Naval Armed Guard. U. S.
1-In spite of field conditions and this week from Pfc. Joseph York New York. ny dutv, Chaplain Zwitman and Miami. Joe writes from Sgt Harold L. Baumttein. 21.
almost astronomical. Other ceived his second citation, the the air force. Out This Coupon and MaQ To "WAR RECORDS. Army- Department of Welfare. 155 E. Flagler St. 822 Lincoln Rd. WwJ^SSS Str~t t 37th Ave. Phone 5191 West Pahn Beach, Pla. The "Y" was honored by Hon. ernment to aid working mothers. leasing men for military service. evening, April 6th, at the "Y'. This affair is part <>i the "Y's"
'in the next issue ot the bulletin. remind you dat yo' dues is doo. Servicemen last Friday night a! Buckingham Army Air Field. Ft.
and far i importanl i>>r us t"
be guest Canter. Mr. and Mrs.
morning, Sidney, the sun ol Mr.
. er Laws'' At ii I'M. I combined beginning at 9 A.M.
day morning. Louis Heiman, rep.
Minchah service starts at 7 P.m! Along the same line as above. our bro iic rs to look in retrospect. ritual of the Lodge and should! BMW PAGE FOUR +Jeistn>rjdiain_ FRIDAY, MARCH Jl The Jewish Floridian Plant and Main Offices, 21 S. W. Second Av i ami. Fla. P.O. Box 2973 Fhone 1 1 41 Entered as Second Class Matter July 4, 1930 at the Post Office of Miami, Florida, under the Act of March 3. 18.9 FRED K. SHOCHET. Managing Editor Subscription1 Year, $2.00 Six Months. $1.0 MIAMI. FLORIDA. FRIDAY. MARCH 31. 1944 MS AN 7. 5704 VOLUME 17 NUMBER 13 NOTES OF BEACH "Y Who Killed Bjorn Faulkner??? \ i I \ % % U c in a bl  heap I om tins themi evolves me Night i Januarj 16 Written by Ayn Rand in ;> style quite differenl from the usual thriller, the three-act drama will p. pri sented April 2. 3 and 4 by th< VM and wHA players. ;< r, AID IMPERATIVE When President Roosevelt established the War Refugee Board j to forestall the diaboical plan of the Nazis to exterminate the gm^ ] Jews in Europe his action was not only acclaimed by_ Jewish ^ .,, uj( v leaders in America as expressive of the humanitarian principles Ni , kv R U bin, B Her, and traditions of the American people, but as bearing evidence p, . \\ R jtty of a determined effort to effectuate the immediate release of the ' ', h persecuted minorities trapped in the tentacles of the Mm gj* cannibals. Harold G rd n and Th< When it was subsequently announced by the White House g that the President was pondering the appointment of an execuTw most ii tive director of the Board, the hope was privately expressed in support,, will >,_ £ Jewish circles that the appointee would be a person of sutlicient stature capable of rising to the requirements of the tremendous Ui ;; band down t I the task that would be entrusted to him. That hope has been more end oi the trial What will than vindicated with the appointment of John W. Fehle. the wrdid GU1L1 Y o, NO! That Mr. Pehle was the right man for the job was quite evi' A ;. % dent from the very moment he assumed office. On the day ot f (1|l his appointment he was asked by representatives of the press for "Y" members, and to state what action the Board was planning to fuither its funcnoi A Jui .ions. His terse answer was-'the Board is already acting JjJJ S overseas." ion is lie for "' During the approximately two months that Mr. Pehle has and 22, I been heading the Board he has not only evinced a keen aware0 tti Mian Bi ness of the plight and problems of the victims he hopes to save, Y | y v \ ., i.i. TU,. 'he most prcmiising i n its but also a disposition to act promptly and expedit.ously. This } gnd ,was evidenced, among other things, by the speed with which n Firsl Annual B ir Ira Hirschmann was sent to Turkey where, last week, he was and Carniva It wi I be hi outreported to have made satisfactory contact with the Turkish SOMETHING TO REMEMBER "My mind runs to a name familiar to you all -Chaim Weir, mann who came over to this country because he saw ug on the point of making some very serious mistakes with regard to our rubber program and because he felt that oil could not do h by itself, and so he brought in alcohol to do the job. ... And I know of my own definite personal experience, because h e came to me at that time and I made the connections for him I know that he made it possible for us to avoid a very, very serious mistake in terms of the war eflort." This statement wi made by none other than Vice President Henry Wallace, speaks volumes for the importance of the U. S. Government attaches to Dr. Weizmann's contribution to the American war effort. WAR NEWS The title of Number-One man in the Army Air Forces in point of physical fitness has just been copped by Air Cadet Milton R. (Bob) Fromkin of Omaha, son of attorney Max Fromkin of that city. Bob, who is a nephew of Morriss Fromkin, well-known member of the New York and Milwaukee bar, also came out winner in the Tennis Championship of the 352nd Cadet Training Department some time ago. Flying Officer S. S. Shulemson of the RCAF, who recently was awarded the Distinguished Service Order for "inspiring leadership, great skill and courage' in an attack on an enemy convoy, is the son of the Saul Shulemsons of Montreal. There's a new soothsayer in town, Myrus by name, who predicts that the war in Europe will be over this year and that the Pacific war will take another two years to win. We don't, of course, vouch for the prognosticator s reliability and we do hear that he invariably loses his bets on the races. and the spacious grounds from the --;-t:;r;:;;o;,orand'bunt: of the gayest of fetes. While Balkan countries. Unfortunately, the situation has changed since then, a week ago it looked as we might look forward with some degree of confidence to the rescue of some Jewish refugees, the sudden occupation of Hungary by the Nazis, who seem to be determined to spread their rule to the rest of southeastern Europe, has darkened the outlook. What the satellite countries may have been willing to do now that they realize that Hitler has lost the war, Germany will not do. All avenues of escape are now seemingly closed to Jewish refugees in Europe. We have no means of knowing what measures Mr. Pehle is contemplating to meet this new and. perhaps not unanticipated, situation. We are confident, however, that he wil not let it deter him from his task. The adage "where there is a will there is a way" holds sway in war as well as in peace. Mr. Pehle has shown that he has the will. For the three evenings the C mmittee will bring to its audiences the cream of this town's entertainment world. Each and every evening of the Bazaar will be sparked by the wit and talent of this area's nightenes. DR. WEIZMANN'S CONTRIBUTIONS Speaking before the American Palestine Committee, VicePresident Wallace declared that Dr. Weizmann. the President of the Jewish Agency for Palestine, had made an important scientific contribution to the war effort. "I know it from my own definite personal experience that Dr. Weizmann made it possible for us to avoid a very serious mistake in terms of the war effort," said Vice-President Wallace. "Dr. Weizmann came over to this country because he saw us on the point of making some very serious mistakes with regard to our rubber program and because he felt that oil could not do itself. And so he brought alcohol to do the job." In the first Word War, Dr. Weizmann also made a significant scientific contribution which came to the aid of the Allies in a critical hour. The scientific contribution is great. There is another sacrifice which one would have liked to have spared Dr. Weizmann Flying with the R.A.F. was a son of Dr. Weizmann, who showed something of the same scientific promise as his great father But this young flyer lost his life fighting for the Allies. Another of his sons was wounded in action. Yes, Dr. Weizmann has contributed heavily to the Allied cause. He has given everything he possessed and cherished the most! PASSOVERS A TRADITION HOROWITZ -MARGARETEN Matrons Matzoh Meal Cake Meal Egg Motions Farftl Potato Pancake Mix Nearly a score of superior Passover products that enSTAGE AND SCREEN If the plan to have John Garfield star in a new war film goes through, you may expect an extraordinarily fine performance. John has been playing the "foxhole circuit" in Italy, and keeping his eyes and ears open. Erich Wolfgang Korngod, who has been in Hollywood for many years now and has some of filmdom's finest musical arrangements to his credit, will be coming East soon to conduct for "Helen Goes to Troy,'' scheduled to open this spring. Now they say that it's Greta Garbo who will play the Divine Sarah Bernhardt in the projected film biography of that illustrious actress. Cecil B. De Mille is said to be thinking of screening Thomas Mann's famous trilogy on the Biblical Joseph. WEEKLY GIGGLE Harry Hershfield likes to tell the story of the lunatic asylum in Germany whose director, expecting a visit from the Fuehrer, drilled all the inmates so that their "heiling" and saluting would testify to the complete Nazification of that institution. ... So Hitler came, and in every padded cell and every less isolated ward each and every man and women greeted him in true Nan fashion. All, that is, but one man. Hitler eyed him with indignation. "Why don't you solute me?" he roared. .. "Who, me?" exclaimed the man. "I'm the keeperI'm not crazy." HOiliDA S W IRIEti II $ SERVING JINEST AMIRICAN j[WISh 0 I N N £ II % IIW M C DISTRIBUTED BY NATIONAL BRANDS. INC 690 N. W. 13th Street Enjoy The SEDARIM and the entire '* PASSOVER WEEK IN THE TRUE TRADITIONAL MANNER True Farm Food Restaurant 645 COLLINS AVENUE. MIAMI BEACH Under the Management of Nathan Ginsberg Services Conducted by a Prominent Cantor STRICTLY KOSHER MAKE EARLY RESERVATIONS PHONE 5-7107 MATZO MEAt_* FARFELiCAKE MEAL-.WHOLE WHEAT MATZ0  EGG MATZQ !"